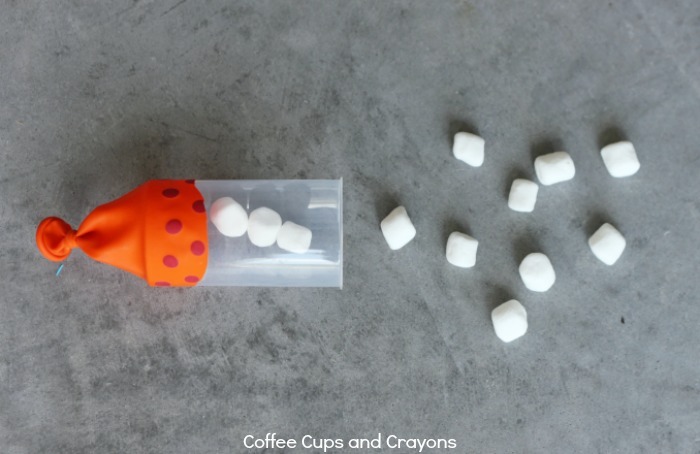 This marshmallow shooter DIY is a childhood must do! It’s a simple kids activity that doubles as a science project and is so much fun you will end up playing with it even after the kids are asleep. True story. 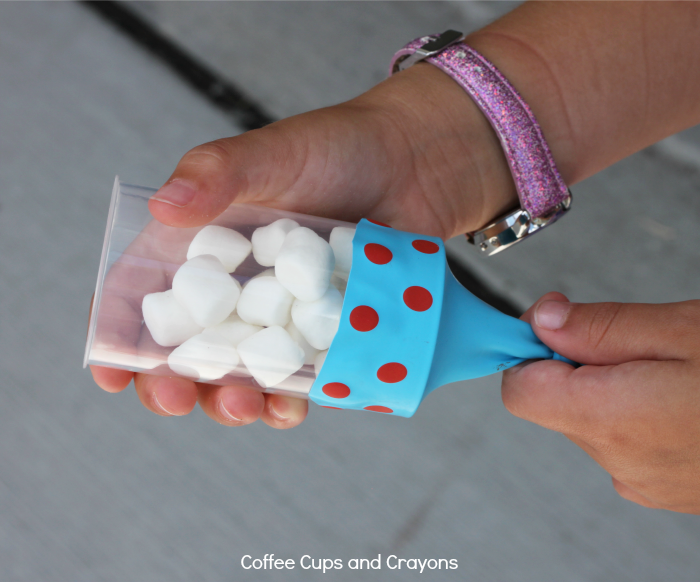 This version of the marshmallow shooter is made with a cake pop container so the next time you have one at a party make sure to save it–you can turn it into hours of fun for your kiddos! 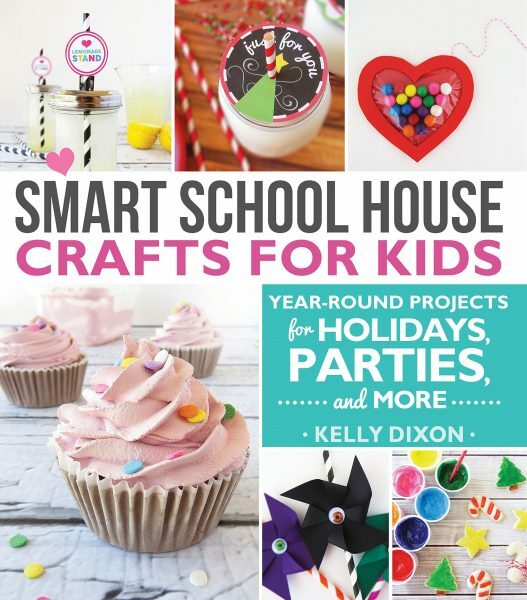 This fun kids activity is inspired by one of our favorite new books Smart School House Craft for Kids! We are big fans of the author Kelly Dixon and I pre-ordered her book on Amazon way back in 2014 before it was even for sale. I knew my kids would love it and they do–my preschooler takes it to bed with her to “read” at night! Take an un-inflated balloon and tie a knot in the end. Then cut the bottom half (rounded part) of the balloon off. 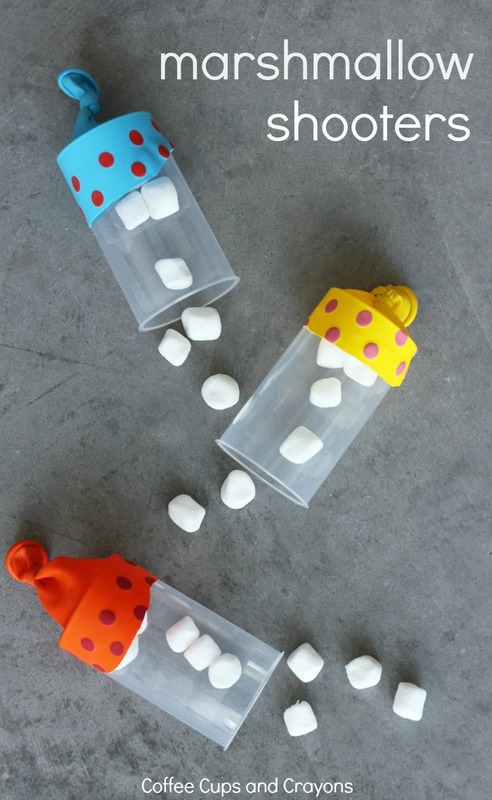 Stick the open end of the balloon on the bottom end of the cake pop container and you are ready to play! If you have energetic shooters (like I do!) you may want to use a rubber band to reinforce the balloon. It will help it stay on no matter how hard they pull. As soon as ours were ready my kids wanted to load them with as many mini marshmallows as possible! We found though that just shooting one marshmallows at a time made the marshmallow go farther. Experiment with your kids to see how changing the amount of marshmallows or force used changes the outcome. It’s a great way to get kids thinking critically and having fun! what is a cake pop container ? Where do you get it from. 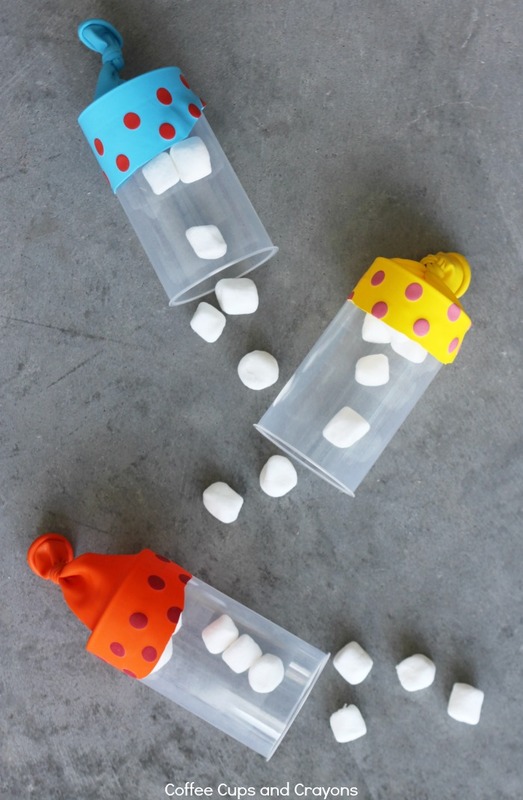 They are clear containers you can make those “push up” style cake pops in. They are in our craft stores like Michael’s and Joann’s. You could also use a sturdy plastic cup too I bet! Hi, I bought some Wilton treat pop containers at Walmart, but they had a bottom in them, just a small hole for the stick to go through. Could you post a link to the product that you bought? Thanks in advance! Genius idea!!!!! I’m actually going to grab some and save them for Christmas/Valentine’s Day/4th of July shooters! Love the spy theme! This is certainly a safer alternative to playing with nerf guns. Also, such a clever use of balloons! I bet there were a lot of great photo opportunities while the kids were playing with these! Next time, save the memories with Keepy! Well at least it’s not just me!!! i bet you could use toilet paper tubes! Unfortunately they don’t make TP tubes or plastic drinking cups as sturdy these days. What about trying a sliced up pool noodle? You can get them at the Dollar Store! I made mine with a half of a toilet paper tube and used small pom poms since we will be making them inside at a Library function. They worked fabulously. I secured mine with a rubber band but I might let my kids glue the balloon to the tube for security. Great idea!! That is so smart!!!! Very cost effective! Thanks for sharing!!!!! I sit for 2 kids and we made these with throwaway cups. We used ping pong balls. They worked great, too! Every summer at our library we read the book ‘The Marshmallow Incident’ and make our own shooters. We use plastic cups with the bottoms cut off and the sharp edges lined with fun duct tape. Then we square off across each other forming the towns of Left and Right and FIRE!! We do use Pom Poms now due to a very sticky, messy ‘marshmallow incident’ of our own. Very FUN!! Just put them inside the cup and pull the back on the end with the balloon and they pop out! I have made these with empty toilet paper rolls instead of cake pop & duct tape instead of rubber bans. Kids LOVE these! YAY!!!!!!!!!! I love that! So easy! I had a lot of tennis ball containers and I did this with my residents at the nursing home when the preschool came to visit. Huge hit. Canons instead of little guns. That is AWESOME!!!!!!!! That had to be a blast! Found you on Pinterest, such a great idea! I am putting together “marshmallow shooter DIY” kits for my kids’ stockings, and I’m thinking about using small tomato paste cans with the sharp edges sanded off. They wouldn’t be as pretty, but very sturdy! Oh I bet that would be super sturdy! I teach kindergarten enrichment and would love to make these with my class. I am assuming that you need a tube shape, since both ends of the cylinder need to be open. Is that correct? I plan to try to shop around to see what is the cheapest option, especially since it looks like you only used the tube part of the cake pop holder. Hi Debi! People are having success with half a toilet paper roll, using duct tape to secure the balloon. Sliced up pool noodles from the Dollar Store also work. Just slice the thin one with a sharp knife–it’s time consuming but way cheaper and lasts longer!